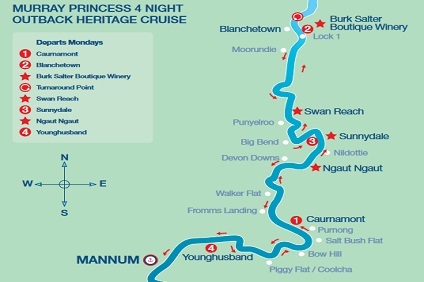 4 Night Outback Heritage Cruise sailing from Mannum roundtrip aboard Murray Princess. This cruise takes you north on the great Murray River from the historic river port of Mannum to Blanchetown. Follow in the wake of great Australian pioneers on a 4 night cruise along the outback river highway. Experience the magic and majesty of the spectacular scenery from towering cliffs to expansive farmlands. Along the way, you’ll see a great variety of Australian wildlife, including kangaroos and many of the 350 bird species that inhabit the riverlands. Highlights include a visit to a vineyard and wine-tasting at a cellar door, visit a typical Australian farm, woolshed and wildlife shelter, enjoy an Aussie barbecue beside the river and visit an aboriginal archaeological site. Mid-afternoon the PS Murray Princess departs historic Mannum, the birthplace of the Murray River trade and communication, and heads upriver while you enjoy a Welcome Dinner. As we cruise under floodlight to our overnight mooring at Caurnamont, you may see nocturnal wildlife on the riverbank. Watch for kangaroos, hairy-nosed wombats, tortoises, egrets and many other species. Our on-board entertainer provides music for the night owls. with beautiful red gum bars. After dinner, join us for all the fun and excitement, and participate in our “Murray River Cup”. After breakfast we cruise downriver to picturesque Swan Reach. The town was first settled in the 1850s, was originally the largest of five sheep and cattle stations in the area and is now home to native flower and fruit growers. The original Swan Reach homestead is now the Swan Reach Hotel where you can enjoy an ale or cappuccino overlooking the Murray River (additional cost). Join the guided walking tour and visit the Swan Reach Museum – a must for every visitor. Cruise downriver after lunch and take in the tranquillity as the landscape slides by. on the banks of the mighty Murray River. An optional Nocturnal tour by tractor and cart is available after dinner (additional cost). Captain’s Buffet Dinner. Dress up and dance, if you wish. breakfast we reluctantly say farewell as we arrive at the Mannum Wharf.